Yahoo has mostly been known for its powerful search engine, but it has also gained worldwide popularity due to its web building tools. Yahoo Small Business Website Builder is the solution that is worth the attention and can be considered a worthy competitor in the web building niche. It has been available under different names during 20 years and it still remains in demand with small businesses, entrepreneurs and renowned brands. The service is offered as a part of Yahoo products tailored for small business and, thus, it comes with a powerful under-the-hood feature set. Are you interested to find out more about the platform to compare it with other web building tools? That’s exactly what we are going to do right now. So, let’s proceed to the detailed Yahoo Small Business review to see what features and options it is ready to offer. Yahoo Small Business website builder feature set isn’t competitive. It’s okay as a standalone product, but it really loses its steam when compared with other web services like Wix or uKit. It is initially tailored for newbies and, thus, it isn’t supposed to require any technical or web design background at all. The website builder supports drag-and-drop editing and it’s not difficult to get started with it. With lots of customizable designs, web building tools, mobile-friendly themes and abundance of options that contribute to the efficacy and convenience of the web building process, the website builder is certainly worth the attention of non-techies as well as of web design pros. Whatever website type you are going to launch, Yahoo Small Business is a top destination to get started. Websites, hosting, domains and powerful feature set – the website builder has everything your business needs to gain online success. Yahoo Small Business website builder offers versatile out-of the box functionality. The range of features the system provides is enough to launch a decent website. It empowers business owners and individuals to establish reliable web presence in less than no time. Blogging platform, where you can launch a decent blog and connect it to your website in a few simple steps. You just need to add a corresponding section to the website, which is under the development, choose a layout for your blog and customize it as you wish. The system uses the White Label solution offered by IM Creator, which allows getting the most out of the feature set of this powerful website builder. The feature set makes it possible to build and publish a quality website with the system, but it still lacks deeper customization and flexibility. However, the service developers keep working on the advancement of its functionality, due to which the feature set becomes more extended. As of today, Yahoo Small Business website builder offers a bit limited collection of templates, which includes 36 pre-designed clean themes that can do the job for you. For the ease of use and search time economy, the templates are subdivided into several categories based on the niche they focus on. These include Business, Services, Design, Health and Fitness, Photography, Restaurants and Food, Catalog and Retail, Portfolio and CV, Fashion and Beauty, Weddings, Music and Video, Lodging and All. Just browse the category you are interested in, pick a theme to get started and personalize it with no coding at all. The themes are mobile-optimized and look great on any device. They are created to build stunning websites with high performance. If needed, you can enhance their design with various multimedia features the system offers. All in all, Yahoo Small Business templates are modern, stylish and neat – this is exactly what you need to try for your business promotion. Yahoo Small Business has a powerful community help center, where inexperienced users can find out answers to their questions and solve the problems they face, when using the system. This is the major online destination to get in touch with other users, discuss the burning problems, view multiple articles, tutorials and contact the support team, if needed. To simplify the browsing, the service developers have singled out the major categories, which contain all the related questions. Whether you have problems with your account, services, merchant solutions, web hosting, domains, website builder, local marketing etc., finding solutions to them won’t be difficult. Just specify the service or the issue you are concerned with to get relevant support options. A convenient search filter allows browsing through the section to find articles and discussions that might prove to be a valuable source of information. There is also an opportunity to look for the required info in a community blog, where you can get tricks and tips on how to run your business effectively. The same is about the community forum. This is the place, where you can find lots of branches and topics, join conversations in them to discuss your business challenges, share your experience and help other users solve their problems. The website builder also has its YouTube channel, where they upload interesting and informative video content, which can also help you start and manage your website. What’s more, the website builder offers 24/7 phone call customer support, live chat and professional online assistance available to all premium plan users. Professional Plan ($10/mo billed annually) that provides all the features of the above mentioned plans plus the advanced options like private domain registration, 10 GB of disc storage space, 5 email inboxes and multiple email aliases. Whatever plan you will go for, the system offers a 30-day money back guarantee. This is a notable factor for many users, which boosts customer trust and loyalty. Yahoo Small Business is a website builder, which provides extensive out-of-the-box functionality. It ranks high in terms of usability, providing the full list of features for small and medium businesses. The service allows building websites, which are easy to manage and customize, even though, non-techies may find it a bit confusing. The website builder provides domain name, hosting and business email to cover all the customers’ business needs. There is also an opportunity to promote your company listings in dozens of local directories to ensure the utmost online exposure and traffic generation. All websites created with the system come with SSL certification, which ensures their smooth and secure performance. Website templates are mobile-optimized by default and can be easily customized due to the extensive range of integrated web building tools. Yahoo Small Business has a blogging platform, but it lacks an eCommerce engine, which is a demerit for many business owners. 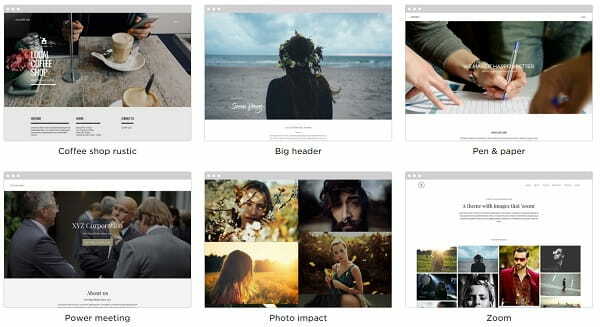 For the rest of users, the website builder is functional and affordable. If you haven’t tried it yet, it’s high time to do that.